Orca Currents are short high-interest novels written expressly, for middle-school students reading below grade level. Orca, Currents deal with contemporary themes such as bullying, friendship, family issues, and facing your fears. 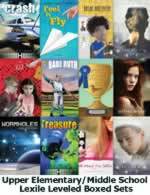 They are appealing, fast-paced stories that will appeal to reluctant readers. Orca Currents Level L includes the Orca Currents with the lowest reading levels (grades 2.0 - 2.9), The following 30 titles are included in this collection: Agent Angus, Beyond Repair, Blob, Bungee Jump, Camp Disaster, Cheat, Chick: Lister, Death Drop, Disconnect, Dog Walker, Eye Sore, FaceSpace, Living Rough, Maxed Out, Mirror Image, On Cue, Out of Season, Perfect Revenge, Pigboy, Power Chord, Pyro, Rebel's Tag, See No Evil, Sewer Rats, The Shade, Shatterproof, Siege, Spoiled Rotten, Taz's Recipe, and Three Good Things. Orca Currents Level M includes the Orca Currents with the middle-range reading levels (grades 2.9 – 3.5), The following 30 titles are included in this collection: Bad Business, The Big Apple Effect, Cabin Girl, Caching In, Caught in the Act, Cracked, Destination Human, Explore, Flower Power, Hate Mail, Horse Power, Hold the Pickles, Hypnotized, In a Flash, Junkyard Dog, Laggan Lard Butts, Marked, Nine Doors, Oracle, Reckless, Rise of the Zombie Scarecrows, Skate Freak, Slick, Special Edward, Storm Tide, Stuff We All Get, Sudden Impact, Swiped, Wired, and Watch Me. Orca Currents Level H includes the Orca Currents with the highest reading levels (grades 3.4 – 4.5), The following 29 titles are included in this collection: 121 Express, Ace's Basement, Alibi, Bear Market, Benched, The Big Dip, Bio-pirate, Bones, Branded, Camp Wild, Chat Room, Crossbow, Daredevil Club, Farmed Out, Fast Slide, Finding Elmo, Fraud Squad, High Wire, Leggings Revolt, Lost, Manga Touch, Queen of the Toilet Bowl, The Snowball Effect, Splat!, Stolen, Struck, Tampered, Vanish, and Windfall. 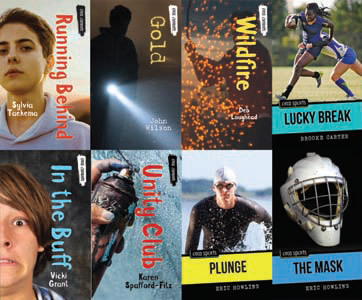 Orca Sports are perfect for reluctant readers, these titles combine mystery and adventure with team sports such as hockey, baseball, football and soccer, and solo sports like scuba diving, running, sailing, horse racing and even race-car driving. Orca Sports books engage young readers with exciting plots and easy-to-read language. They are appealing, fast-paced sports stories that will appeal to middle school readers. Reading levels range from grade 3.5 to grade 4.5. This collection includes these 25 top selling Orca Sports titles: Above All Else, Absolute Pressure, Betting Game, Blazer Drive, Centerville, Cobra Strike, Crossover, Dawn Patrol, Dead in the Water, Flying Feet, Gang Tackle, Hurricane Heat, Hurricane Power, Jumper, Kicker, Maverick Mania, Off the Rim, Paralyzed, Powerslide, Rebel Glory, Scarlet Thunder, Slam Dunk, Titan Clash, Two Foot Punch, and Venom. Orca Limelights are great for reluctant readers, these titles are short high-interest novels that combine social issues with the performing arts such as dance, singing, acting, playing instruments and even circus performing. They are appealing contemporary novels that will appeal to middle school readers. Reading levels range from grade 3.5 to 6.0. This collection includes the following 27 titles: Across the Floor, At Ease, Attitude, Big Time, Billboard Express, Breaking Big, Cut the Lights, Forcing the Ace, The Frail Days, Getting the Brush Off, He Who Dreams, High Note, Honeycomb, Hot New Thing, Learning the Ropes, Off Pointe, Pop Quiz, POV, Raising the Stakes, Rock the Boat, Shimmy , Show Mode, Stepping Out, Strings Attached, Totally Unrelated, Upstaged, and Warm Up. Orca Soundings are short high-interest novels for high-school readers. Orca Soundings deal with edgy, contemporary themes such as relationships, gangs, teen pregnancy, racism and drugs. These exciting stories are books reluctant teen readers want to read. Orca Soundings Level L includes the Orca Soundings with the lowest reading levels (grades 2.1 - 3.0). This collection includes the following 30 titles: Another Miserable Love Song, Battle of the Bands, Big Guy, Bike Thief, Bull Rider, Cellular, Coming Clean, The Darwin Expedition, Exit Point, Exposure, Fastback Beach, Grind, I.D., Infiltration, Juice, Last Ride, Lockdown, Middle Row, No Problem, One More Step, One Way, Overdrive, Riot Act, Saving Grace, Shallow Grave, Snitch, Something Girl, Spiral, Tough Trails, and Yellow Line. Orca Soundings Level M includes the Orca Soundings with the middle-range reading levels (grades 3.0 – 3.4). This collection includes the following 30 titles: B Negative, Blue Moon, Crash, Crush, Dead Run, Deadly, Death Wind, Fallout, First Time, Hannah's Touch, House Party, In the Woods, Jacked, Kicked Out, Masked, My Time as Caz Hazard, Night Terrors, Outback, Plastic, Refuge Cove, Responsible, Riley Park, Rock Star, Running the Risk, Scam, Sea Change, Tap Out, Triggered, Truth, and Zee's Way. In our increasingly fast-paced world we believe there is a need for well written, well-told books that can be read in one sitting. 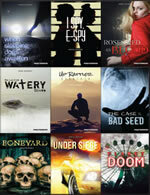 Rapid Reads are engaging short (120-168 pages each) novels for adults and mature teens. They are intended for a diverse audience, including ELL students, reluctant readers, adults who struggle with literacy and anyone who wants a high-interest quick read. Reading levels range from grade 2.0 to grade 5.0. Orca ELL is a mix of less edgy, fast-paced novels from Orca Currents and Orca Sports aimed at middle-school English language learners. Orca Currents are short high-interest novels for middle-school readers. Orca Sports are short high-interest novels about sports for middle-school readers. Reading levels are under grade 4.5.